Giant Singapore is on a search to discover the most kiasu town in Singapore with the highest number of residents who will go the extra mile for cheap deals, offers, and discounts—or as we say, lobangs. Singapore’s leading supermarket chain hopes to encourage healthy inter-town competition while uncovering local insights into what makes Singaporeans kiasu. From now till 25 October, Singaporeans can take part in a short and cheeky online personality quiz that assesses how kiasu they are. Based on their answers, participants will find themselves identified as one of four personality types: Atas Maximus, Bo Pian HeckCare, Klassic Kiasu and Lobang Queen. Each participant’s result is then collated, based on their postal code, into an overall town scoreboard that showcases the top five towns in the running for first place. Participants can also triple their contributing score by sharing results or liking Giant’s page on Facebook. At the end of the campaign and in celebration with the most kiasu town, Giant will host a special one- day-only mega giveaway at the winning town’s nearest Giant outlet. Kiasu residents can expect amazing lobangs such as freebies and treats as a reward for rallying together as a community. Don’t say bo jio! In just over two weeks, over 47,500 submissions have been recorded and mid-way quiz results put towns of Jurong West, Serangoon and Tampines in the running for top three. At a buffet, one in three Singaporeans would first target what he or she thinks is the most expensive dish before moving on to cheaper ones. More than 70% of Singaporeans would do the Macarena live on television, run to a tree or post a shout-out on Facebook just to score a $1 discount from Giant. More than half of Singaporeans would do anything to combat the haze should it return, such as closing all windows for weeks and buying out all the N95 masks available. Nearly half of Tampines residents would press the traffic light button repeatedly in hopes that the light will turn green faster. Must be the shiok factor! Tampines residents are twice as likely compared to other town’s residents to rush and eat all the food in a buffet before others can get to it. Half of the residents in Tampines would use either tissues, an umbrella or a bag to chope seats at a coffee shop. Nearly twice the average of other towns! One in three Tampines residents would accept free concert tickets, despite not being a fan, so that they can re-sell them on Carousell. Jurong West residents would go to great lengths to win, including bringing their TOTO papers to a temple to pray over for luck. The residents of Jurong West know a good deal before they even see one. Three out of four Jurong West residents would join a queue before finding out what it is for! Win already lor! When it comes to education, don’t play play with Jurong West. More than half will ‘Facebook friend’ all of their chosen school’s teachers and principal and jio them for coffee to get their kids into that top school. With just a week to go, Singaporeans still have the opportunity to boost their town’s performance before the final results are tallied and score lobangs! 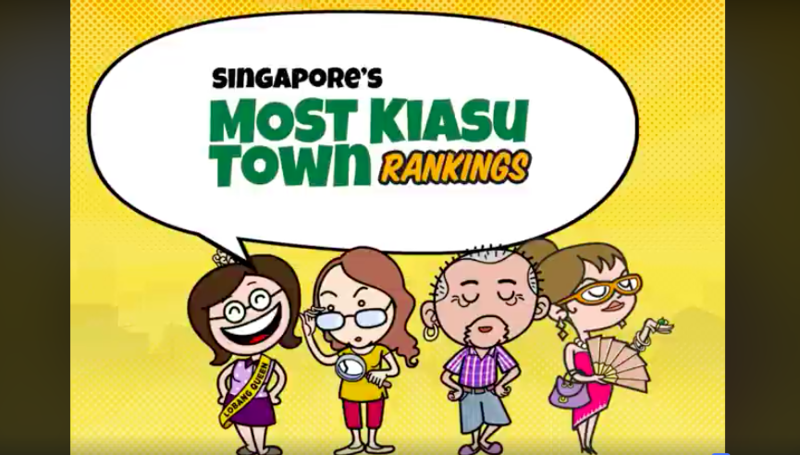 The Kiasu Town quiz is part of Giant Singapore’s continued commitment to offer the best lobangs in town. Through the Giant Super Savers Club, bargain hunters can gain access into saving tips, weekly flash deals, giveaways, and a bunch load of exciting offers so everyone can become a lobang queen. Visit the official Facebook page for updates.